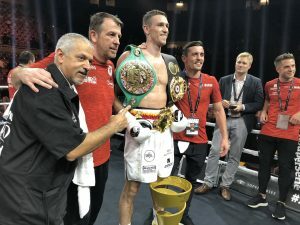 Callum Smith stopped George Groves in the 7th round in world class fashion, to become the new super middleweight WBA and Ring Magazine champion, as well as the first ever World Boxing Super Series super middleweight conqueror. Tonight’s venue was the 10,000-capacity seat arena within Jeddah’s King Abdullah Sports City, the first official event of its kind held in Saudi Arabia’s second largest city, but the unusual venue didn’t change the approach that usually starts George’s bouts. As always seems to be the case in Groves’ fights, the two fighters made a tentative start, both pawing away with the jab, attempting to find a weak spot early. Smith, in the immaculate white and silver shorts, looked comfortable firing off the counter. The 2nd saw both fighters land eye-catching shots but it seemed the WBA champion’s work behind the jab made the difference. With just over 1:30 left of round 3 though, ‘Mundo’ landed a counter-right hand that shook Groves, 28-3 (20KOs), enough to back him up and, for a brief moment, look shaky. Smith, 24-0 (17KOs) was unable to properly capitalise and ‘The Saint’ regained his equilibrium and end the round relatively well. Though Smith landed a crowd-pleasing right hand at the beginning of the 4th, George boxed smartly from there. Smith seemed undeterred however, when his fellow Brit landed, Callum kept his head up and continued to maneuverer forward; even when, with 18 seconds left of the 5th, ‘Mundo’s’ feet were swept from underneath him after the two fighter’s legs became entangled. Into 6 and 7 – despite another awkward fall that saw Smith on the canvas – it felt as if the WBC ‘Diamond’ champion was getting into his groove. He wasn’t just landing pleasing shots now, the Liverpudlian was forcing the tournament’s #1 seed further and further back. With less than 1:20 left of round 7 Smith landed an almighty left hook that shook ‘The Saint’ to the ropes, unable to reply as ‘Mundo’ continued to land until he was forced to drop to his knee. The referee stepped in to call a conclusion to proceedings just as Callum landed one last right hand. A clinical finish from a man who is no doubt tired of being called un-proven. You can no longer label him that anymore. With legends like Naseem Hamed and Evander Holyfield already in the ring, Rashida Ali, Muhammad’s daughter, presented Callum with the WBSS trophy to top off a lifechanging night for Callum Smith. Now the main man at 168lb, Smith acknowledged the significance of tonight’s win. Now for only the 3rd time in the belt’s history, the Ring Magazine has an owner, the World Boxing Super Series super middleweight champion, Callum Smith. A bearded Chris Eubank Jr moved to 27-2 (21KOs) with a 3rd round technical knockout of JJ McDonagh. The southpaw from Ireland, McDonagh, bizarrely fell to the canvas in the 1st round after receiving what looked like a routine left hook to the side of the head. The Irishman regained his senses, but it put Chris up on the cards immediately. Eubank looked to have the upper hand, despite it being competitive, JJ pulled out at the end of round 3, seemingly a shoulder injury. In the corner between rounds 3 and 4, Eubank could be heard shouting to the opposite corner, ‘‘Don’t do it. Don’t do it.’’ Unfortunately for those watching, he did. ‘‘It was a good fight while it lasted but the going got too tough for him, so he quit.’’ Chris said post-fight. JJ McDonagh joined the interview and got himself riled up when Chris told him he could’ve fought on, leading the Irishman to say, ‘‘I’ll fight you right now with one hand.’’ A strange offer from a man who 10 minutes earlier, literally had the opportunity to fight him with one hand. The 29-year-old was the main event’s injury reserve and although the tournament hasn’t unfolded the way he predicted, Eubank will no doubt have gained some new fans after two entertaining scraps with WBSS quarterfinalist, Avni Yildrim and tonight’s loser, George Groves. Darren Surtees, an undefeated welterweight from County Durham scored a 2nd round knockout over 8-4, Kane Baker to improve his own record to 9-0 (6KOs). Baker was dropped in round 2 by a short-left hand, and then Surtees unleashed a volley of punches which ended in a left-hook which sent Baker falling into the ropes and eventually onto the canvas. Darren landed a cheeky right hand for good measure whilst his foe was on the way down. The only representative of Saudi Arabia on the card, super lightweight, Zuhayr Al Qahtani moved to London when he was 12 and today, he moved to 5-0 (0KOs) after earning a 4-round decision over late replacement, Mohamed Mahmoud, whose now lost all six of his professional fights. Al Qahtani looked slick as he landed quick-handed combinations, however it was Mahmoud who ended the 1st brightest, landing occasionally but clearly hard enough to upset Zuhayr’s flow. The fight continued to be entertaining, if a little stop-and-start due to holding and messy breaks but ultimately, ‘The Arabian Warrior’s’ performance was good enough to get the win. Cruiserweight, Mikael ‘The Beast’ Lawal, 7-0 (5KOs) heading into tonight, added another W and KO to his pro record with a 3rd round knockout of journeyman-in-the-making, Tamas Kozma. The Hungarian, Kozma made the better start of the two but in the 3rd, Lawal landed a chopping overhand right to the back of the head, dropping his opponent to the canvas and ending the night early. Heavyweight Kem Ljungquist of Denmark made light work of Mourad Omar by stopping the Egyptian after just two rounds, to move to 6-0 (4KOs). The Danish southpaw unrelentingly stalked the 4-1 fighter throughout the proceedings and just as the bell rang for the beginning of the 3rd, Omar told the referee he’d had enough and stayed seated to put an end to the bout. 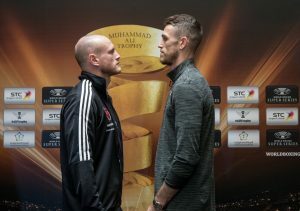 George Groves and Callum Smith spoke to the media ahead of their World Boxing Super Series final bout. The Ali Trophy is up for grabs to end the inaugural middleweight season, delayed by a few months due to Groves suffering a shoulder injury. The bout between the two Englishman takes place in an unusual location, the King Abdullah Sports City in Jeddah, Saudi Arabia. Groves is the current WBA Super World Champion, while Smith is the WBC Diamond title holder, the Ring magazine title will also be up for grabs. This Friday night the super-middleweight World Boxing Super Series champion will be crowned as, ‘Saint’ George Groves goes up against Callum ‘Mundo’ Smith for the WBA ‘Super’ strap, the Muhammad Ali Trophy and, for only the 3rd time in 168lb history, the Ring Magazine title. Groves 28-3 (20KOs), will finish the tournament as he started it, against English opposition. In the quarter finals, the Hammersmith native folded an unbeaten Jamie Cox in half with a brutal body shot in the 4th round. 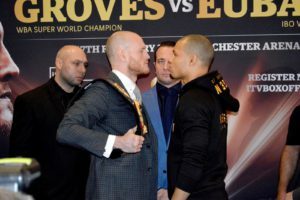 His next opponent was of course, the smooth talking, high-volume punching, Chris Eubank Jr.
Groves proved a level above that night as well, inside Manchester Arena, accelerating ahead on the score cards, making a highly touted Eubank, look very basic. Despite George dislocating his shoulder in the championship rounds, he continued to land heavy shots and move well enough to avoid a late onslaught from Jr.
Smith, 24-0 (17KOs) has arguably had a trickier route to the final. He drew the unbeaten Swede, Erik Skoglund, 26-0 at the time, for his Echo Arena quarter final. It was unquestionably ‘Mundo’s’ biggest test to date as Skoglund was unafraid take Smith’s attack and land his own. It proved costly as in the 11th round, Callum landed a fantastic counter-right hand which wobbled Erik and setup four consecutive punches without reply, forcing the Swede to take a knee. The only blot on that night was the wide scorecards that favoured Smith but didn’t do justice to his opponent’s performance. It was then onto what was originally a final-four date with Juergen Braehmer but, in fight-week, the German veteran pulled out due to illness. In came the slightly left field injury reserve, former kick boxing world champion and 13-0 (10KOs), Nieky Holzken. The Dutchman, like Skoglund, wasn’t afraid of marching forward, unfortunately it was quite clear early on that Callum wasn’t too concerned with the power Nieky had on offer. Originally intended to be the venue for the cruiserweight final between Usyk and Gassiev, the 10,000-seat capacity arena within the King Abdullah Sports City, Jeddah will host the all British super-middleweight bout. It’s first ever boxing event at the ‘Shining Jewel’ complex. The winner on Friday will join Joe Calzaghe and Andre Ward as the only men to claim the super middleweight Ring belt. Boxing this September has very much been the definition of ‘legacy fight’ month. He’s been busy. In the last 14 months, undefeated Greek Australian fighter George ‘Ferocious’ Kambosos Jr. (14-0, 8 KOs), left Australia to train in the U.S., made his American debut with a stunning first round knockout of Jose Forero and trained in two world title camps (Pacquiao vs. Horn, Pacquiao vs. Matthysse). 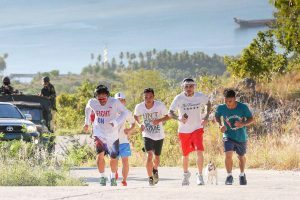 With his eyes clearly set on the prize, a world title, Kambosos Jr. has also found a friend and mentor in Pacquiao (59-7-2, 38 KOs), boxing’s most heralded 8-division world champion, having now sparred over 110 rounds with the legendary fighter. The 25-year-old Kambosos Jr., who shares a coach with Pacquiao in former world title contender Justin Fortune and who is managed by Lou DiBella, will fight Filipino fighter JR “Star Boy” Magboo (17-1-2, 8 KOs) in the featured undercard of the Pacquiao-Matthysse WBA welterweight title fight in Kuala Lampur, this Saturday, July 14th on ESPN+. It was Pacquiao who insisted on adding his constant sparring partner, Kambosos Jr. on the already packed undercard roster. I caught up with Kambosos Jr. via videoconference, just days ahead of his fight and talked about his friendship with Manny, training regimen and goals for his own world title campaign. When Kambosos Jr. fights this weekend, it will have only been ten weeks since his last fight in May. He said it is the fastest turn around of his career and he likes it that way. He had trained hard for his American debut against Jose Forero, amassing over 150 sparring rounds prior to the swift win by TKO. By June, he was once again on a plane to the Philippines to reunite with Pacquiao. And after their first sparring session, got put on the undercard. So says lightweight contender, George Kambosos Jr, who, at 13-0, will be making his American debut this Saturday evening at Connecticut’s Foxwoods Resort and Casino against the 13-6-1 Jose Forero. Kambosos is certainly a fighter to watch, one who employs lightning fast speed and an ability to work both the head and body simultaneously. The Sydney, Australia native also possesses an engaging, outgoing personality, which lends itself well to the contemporary American fight scene. As much as he longs for ring success, however – and the man certainly wishes to attain considerable heights – Kambosos also wants to help those in need, namely those who live through the type of experience he had growing up. Kambosos didn’t just trade a few punches with Pacquiao, his role was to legitimately help train the titlist for the Horn match. “Manny has extreme speed and so do I,” says Kambosos. “He’s still got it when he’s on.” Oh, and in case anyone’s wondering, Kambosos agrees with many people when it comes to the most controversial judges’ cards of last year. “I still believe he won the (Horn) fight,” Kambosos states. In fact, the up and comer isn’t of the opinion that the Filipino legend is washed up. “On his (best) day, I still believe he can be anybody,” Kambosos says of Pacquiao. First, though, there’s the matter of Forero. “He’s a solid puncher,” Kambosos says of this weekend’s foe. Perhaps more importantly, “he’s coming in with nothing to lose.” Sure enough, a victory over a lauded rising star would be a huge career builder for any fighter. Kambosos, however, isn’t worried. “I love the pressure,” he says. “That’s why we’re here.” It helps to have a solid background behind him as he makes his stateside debut. “I started boxing at eleven years of age,” he says. “I got a good, solid base from that system.” Plus, training for Saturday has gone well. “It’s been a good camp,” Kambosos states in regards to his preparation, adding he’s been working with “real quality guys.” One of those guys, of course, is his trainer. “I hooked up with the guys in America,” he recalls, “with Justin Fortune.” A former heavyweight of note, Fortune is, like Kambosos, an Australian who made his way to America to at least in part capitalize on the fight game. Now a respected trainer, Fortune has impressed his young contender. “Justin’s great,” Kambosos says. “We gel very, very well.” Although he was once with Kostya Tszyu’s gym in Australia and helped Pacquiao alongside Freddie Roach, Kambosos is happy with the man he has in his corner, just like he is with his career at the moment. As the interview winds down, Kambosos tells of the time he was working with Pacquiao, how his partner was about to give birth to his daughter – now nine months old. “Your life’s going to change,” Pacquiao told him. It was a prediction that happily turned true. Kambosos’ life may change again after he makes his American debut this Saturday. And, if he has his way, the lightweight division will feel the effects. WBSS Preview: George Groves vs. Chris Eubank Jr.
On Saturday night in Manchester, an all-British world title fight takes place when WBA super middleweight champion, George Groves 27-3 (20KOs), steps into the ring with IBO belt holder, Chris Eubank Jr 26-1 (20KOs) in the much-anticipated World Boxing Super Series semi-finals. Both boxers made easy work of their quarterfinal opponents back in October. At Wembley Arena, ‘Saint’ George Groves knocked out fellow Brit, Jamie Cox in the 4th round with a clinical body shot that kept Cox down for the count and served as Groves’ first defence of his WBA belt, which he won back in April after stopping Fedor Chudinov. ‘I don’t like to waste shots so anything I do throw, believe me you’re gonna get hit with it… There’s absolutely nothing there for me to worry about because there’s gaping, gaping holes in that style, in that approach. Away from home and in the heated atmosphere of Stuttgart, Eubank knocked out, walking punchbag Avni Yildrim in the 3rd round of his quarterfinal bout, with a devastating right hook that finished the Turk off, after already forcing his opponent into briefly taking a knee in the first round following an uppercut. ‘It’s more than possible to push through that pain barrier and get up, and I’m sure that he’ll try and use that against me and I’m sure I’ll be prepared for it… It won’t go the 12 rounds, somebody’s getting knocked out. This chin doesn’t have an off button, his does. It’s a difficult fight to conclusively call. It could come down to how well Groves weathers the storm in the early rounds and whether his chin holds up as well as it did against Chudinov. Along with being able to slip and counter off the ropes, if Groves is able to fire off the selection of shots we’ve seen in his 6-fight win streak since losing to Badou Jack back in 2015, Eubank will need to do more to protect himself when those huge swinging hooks go amiss. Eubank may not be pillow-fisted, but he’s lacking that one-punch KO power. Even in his previous bout, the IBO champion constantly landed cleanly throughout the 3 rounds. It’s difficult to envisage a scenario where a seasoned pro like George Groves, gives his semi-final foe so many opportunities to take him out. The second semi-final takes place next week in Nuremberg as super middle & light heavyweight veteran, Jurgen Braehmer, 49-3 (35KOs) goes up against 23-0 (17KOs) Callum ‘Mundo’ Smith. The winners will progress to a final that’s expected to take place in early June at London’s O2 arena. 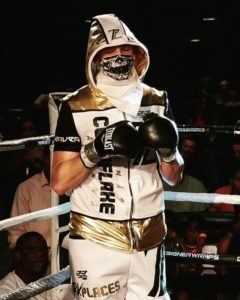 On the undercard, and as long as there’s no late injury to either of the main event fighters, WBSS super middleweight injury reserve, Zach Parker, 14-0 (10KOs) will take on 16-6-2 (10KOs), Adasat Rodriguez. Two British title fights will also be on the undercard as Ryan Walsh takes on unbeaten, Isaac Lowe; and Tommy Langford is up against Jack Arnfield for the middleweight belt. Both Walsh and Lowe have a mutual opponent on their records in Denis Ceylan who Lowe fought to a disputed draw, in March 2017; Walsh was beaten on a split decision to Ceylan five months earlier. It’ll be the first time Tommy Langford, 19-1 (6KOs) defends his British title since 2016, after a 1-1 record in 2017. He was comprehensively knocked out by Avtandil Khurtsidze back in April and ended the year with a routine comeback points victory over 11-36-1 Miguel Aguilar. Jack Arnfield is currently on a six-fight win streak including wins over John Ryder, and former junior middleweight world title challenger, Brian Rose. The Battle for Super Middleweight Supremacy: George Groves vs. Chris Eubank Jr.
Last week saw the Matchroom card “British Beef” take place at the London O2 Arena, the main event pitted Olympian Lawrence Okolie against the skilled prospect Issac Chamberlain. This was promoted as a grudge match between two hungry prospects at the start of their career looking to chalk up the first significant win over a local rival. Unfortunately, despite one of the fighters being nicknamed “Sauce”, the main event of British Beef turned out to be pretty tough to swallow. All eyes will now be turning to Feb 17th. This fight should be close and action is nothing short of certain. Both fighters look to secure a place in the final of the World Boxing Super Series tournament against Callum Smith and both fighters have had wars in sparring previously. History and bad blood makes this an intriguing fixture. Chris Eubank Jr is pencilled as the bookmaker’s favourite. His recent wins have been a display of eye watering hand speed and versatile punch selection. He is comfortable lashing in five and six punch combinations which often pass in the blink of an eye. 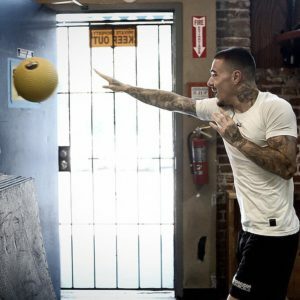 As with most young athletes these days he has also taken to YouTube to help raise his stock with footage of sparring and tearing apart punch bags. Regularly putting the hurt on unwitting sparring partners in a grandiose display of poor sportsman which smells like it has Eubank Snr’s influence all over it. To the casual fan, Eubank Jr will be an attractive fighter to invest time and money in. Loosely following the Mayweather blueprint, he likes to showboat and entertain with gym clips and cute training montages. Take a look at his boxing record however and you’ll see that its built on soft ground. He’s yet to face an elite level fighter. On his day Billy Joe Saunders is world class and that’s where Eubank Jr came unstuck previously. Since that loss he has failed to up the standard of competition to a level where he really tests himself and learns the crucial lessons about swimming in deep waters. 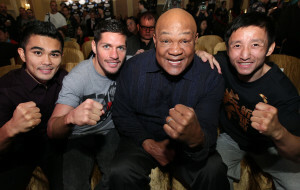 Of his 20 KO’s only one has been a straight knockout, the rest were all TKO’s. Chris Eubank Jr, for all his gusto, lacks knockout power. George Groves has previously walked the walk and he’s consistently fought tougher opposition. A new partnership with trainer Shane McGuigan has sparked a renaissance in George Groves winning a world title in the process. Unlike Eubank Jr, Groves has punching power which can stop a man dead. Carl Froch went down for the second time in his colourful career when Groves delivered a solid right hand, the Cobra was not a man who was easily hurt. The physical attributes of both fighters will probably be where this fight is won or lost. Eubank Jr is not a big 168lb’er and his lack of knockout power highlights this. If he maintains a high punch output he should see out a victory, a stoppage is possible, George Groves is not a hard man to hit. Groves on the other hand is the natural super middleweight, he has power, he hits hard. He’s seen off a number of quality opponents and the experience will give him an extra advantage in this fight. If he can withstand Eubank Jr’s ferocious onslaughts his power and experience could prevail in the later rounds. Eubank has a very slim torso, some early body work could take the wind out of his sails if Groves can find his way in. This is a good match up which will answer more questions than it creates. If Eubank Jr scores an impressive victory he has to be taken serious as a top contender at super middleweight. If Groves picks up the win it cements his status in the divison as a dangerous title holder. His CV is rich with credible opponents and career defining fights. He seldom made it easy for himself, his victories have not always been convincing but he’s come through them and in the process learned more about himself and the sport than his opponent. 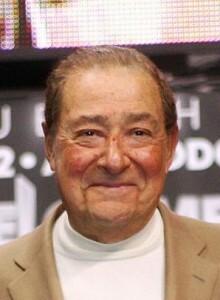 It is refreshing that with this tournament, boxing has produced such an organic means of crowning the best fighter in a division. For these two fighters however, this fight already brings the gravity of a final, in terms of significance, this fight is the one which neither fighter can afford to lose. In the third Super Middleweight Quarter Final of the World Boxing Super Series, George Groves stepped up his claim to be the number one, Super Middleweight in Britain and the world as ‘The Saint’ landed a perfect body shot to stop Jamie Cox in the fourth round. Cox, 24-0-0 heading into the bout, was looking to make a statement from the start, rushing into the bigger man from the first bell and forcing the WBA Champ onto the backfoot. Groves remained composed though as he blocked and deflected Cox’s best efforts through round two. It became a scrappy affair at the end of round two and through round three as the smaller man, Jamie Cox, looked to rough up Groves. But again, his efforts went wanting, as Groves remained superior. Cox unloaded at an impressive pace but Groves ate up the punches and remained the more clinical of the two fighters. Going into the fourth, it was more of the same with Cox looking to establish some kind of superiority until, as Cox continued to unload, he left himself open to the body and Groves, now 27-2-0, sent a crunching right hand that folded Jamie Cox in half and ended the bout. The Groves v Eubank semifinal is set for early 2018. 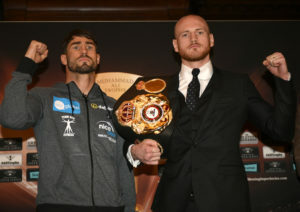 The third Super Middleweight World Boxing Super Series quarter final is set to take place at Wembley Arena on Saturday night in an all British match-up between WBA World Champion ‘Saint’ George Groves (26-3-0 19KOs) and the former Commonwealth Champion Jamie Cox (24-0-0 13 KOs). 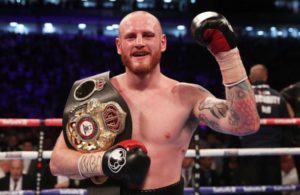 An accumulation of joy, relief and sadness hit George Groves when at the fourth time of asking he had become the newly crowned WBA titleholder. 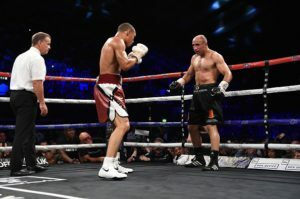 At Bramall Lane, England in May this year Fedor Chudinov gave his all, forcing ‘The Saint’ into rough waters and displaying an impressive chin but ultimately Groves’ relentlessness, world class jab and power showed as the referee stopped Chudinov on his feet in the sixth round of an all action bout. It’s been a long winding road for the 29-year-old Londoner. He’s been part of, and victorious in one of the best British-prospect rivalries between himself and current IBF Super Middleweight Champion James Degale. He was one half of two fantastic all British world title fights, facing up against former WBA and IBF Super Middleweight Champion, Carl Froch. Once in Manchester, then again at the fabled ‘80,000 people’ at Wembley Stadium. He lost both fights. Unfairly stopped in the first and indisputably beaten in the second as Froch knocked out Groves with the last punch of his career. But Groves’ stature and popularity has grown ten-fold because of, and since then. He’s had his rough times. In the lead up to the first Froch fight he split with his only pro career coach, Adam Booth. After defeat in his third world title shot to Badou Jack in Vegas via split decision, Groves separated with trainer, Paddy Fitzpatrick. Then in the midst of cementing the foundations of a fourth world title shot; tragedy. He fought and defeated Edward Gutkneckht in a one-sided fight that, in truth should’ve been stopped earlier than it was. Gutknecht suffered swelling on the brain and to this day remains unable to speak or walk. Life had to go on for Groves though and the WBA World Title needed a champion to hold it, and so it did when he beat Chudinov in Sheffield. The Muhammad Ali Trophy awaits and Jamie Cox is the first barrier to it. Jamie Cox is the relative unknown heading into this bout. Despite a successful amateur career that included a commonwealth gold in 2006, Jamie Cox has never established himself in the pros. Up until 2013 he was fighting at the light middleweight limit, even calling out then British Champion Kell Brook in 2009. Personal problems have also blighted his career and been the cause of inactivity, including an almost two-year absence from the ring between June 2013 to February 2015. The southpaw fights to impress in the early rounds but a tendency to stay on the inside is a concern when he’s up against someone with as impressive a right hook as Groves has got. The standard of opponents up until now is also a concern for Cox. His stand out wins have come against Hungarian Ferenc Albert in a first round knockout, Commonwealth Champion at the time Obodai Sai and a tenround decision win over Martin Fidel Rios in a dirty affair which saw Cox have two points deducted and Rios three. 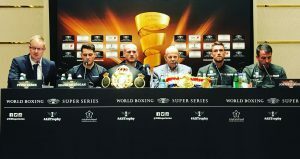 The World Boxing Super Series has created a platform that, for better or worse has set up bouts that wouldn’t normally be looked on as standalone world title fights. George Groves said himself at the quarter final draw that he chose Cox as his opponent because he is the ‘easiest route’. There are stories though of Jamie Cox’s power in sparring and his natural stance and come forward mentality has led to him leading with the head causing his competitors problems, including cuts, that his opponents hadn’t planned for. It’s a problem Groves will have to nullify before Cox can gain momentum in the early rounds. Whoever comes out victorious on Saturday night, Chris Eubank Jr awaits in the semifinal and the IBO Champion is riding high on a wave of momentum since his one punch knockout of Turkish, Avni Yildrim last weekend. It’s set up for an all British semifinal, meaning for certain that there will be a Brit in the final of the WBSS. So says famed former HBO commentator Larry Merchant at the end of Foreman, an intriguing documentary on the life of legendary boxer turned pop culture icon George Foreman, which airs Wednesday night at 8 PM on EPIX. One of the interesting things about Foreman is that his life basically falls into a neat narrative. From brutal street kid, to brutal fighter, to sincere Christian, to the star of perhaps the single best comeback story in all of sports, to life as a permanent fixture in American culture, the Houston, Texas native’s tale has essentially been begging to become a film for years. Needless to say, Foreman the documentary doesn’t disappoint. Foreman’s son, George Jr., is the force behind the film and his choice of Chris Perkel as writer and director is an effective one. Rather than employing a narrator, Ken Burns style, Perkel allows Foreman and those individuals who have been a part of his universe to tell the story themselves. The footage, some of it famous, some of it little seen, accompanies the storytelling in a precise, fast-paced manner that makes for entertaining viewing. The movie rarely lags. What gives the film it’s strength, though, is its theme of change. For Foreman truly became a changed man after entering his darkest moment. It was a change that was as abrupt as it has proven to be lasting. Yet Foreman essentially starts from the beginning, showcasing “Big George’s” rise from street thug to heavyweight champion of the world, an all American tale of one young man’s rise from poverty to the good life. Then comes that famous loss to Muhammad Ali in Zaire in 1974 and the subsequent psychological fallout. It’s at that point that we see Foreman the villain, dying in his locker room after a 1977 loss to Jimmy Young. Yet it’s also at that exact moment that the film presents the man’s turning point. Foreman does a very effective job focusing on its subject’s now famous religious experience, so effective that it should be viewed rather than read about. Whatever one makes of the events of that long ago evening, there’s little doubt they brought about a profound shift in Foreman the man, and that they made him a much nicer guy in general, a fact evidenced by the film’s numerous recollections of family and friends. Naturally, the second part of Foreman goes on to tell the prolonged happy ending millions now know as if it were the plot of a classic film – how the fat, aging Foreman, now a Christian cleric, took up fighting again and eventually, very improbably, managed, at forty-five, to win back the heavyweight title he had lost to Muhammad Ali over two decades earlier before moving on to become an entrepreneur and ubiquitous celebrity. Sure enough, Foreman’s story is so well known as to be spoiler free. Yet the people behind Foreman the film wrap things up quite impressively by returning to the theme of change at the end of their documentary. For those who know Foreman the fighter know that he didn’t just change as a person, but ultimately went on to change as a ring tactician, as well. And the filmmakers rise to the occasion by letting the viewer know just how that first change inevitably led to the second. Rising Star Promotions returns to the Claridge Hotel & Casino, in Atlantic City, NJ, Saturday. They will be featuring 12 bouts with Thomas “Cornflake” Lamanna of Millville, NJ, against George “El Terrible” Sosa for the WBC Silver Latino welterweight title in the Main Event. Former IBF Cruiserweight champion Imamu “Young Ben” Mayfield, 26-10-2 (19), of Perth Amboy, NJ, takes on upset minded Lamont Capers, 7-10-2 (2), of Hawley, PA. Anthony “Juice” Young, 17-2 (6), of Atlantic City, NJ, takes on southpaw Tracey Johnson, 4-5-4 (0), of Boston, MASS.